peek >> << backOld Capper Seniors building, December 2006. 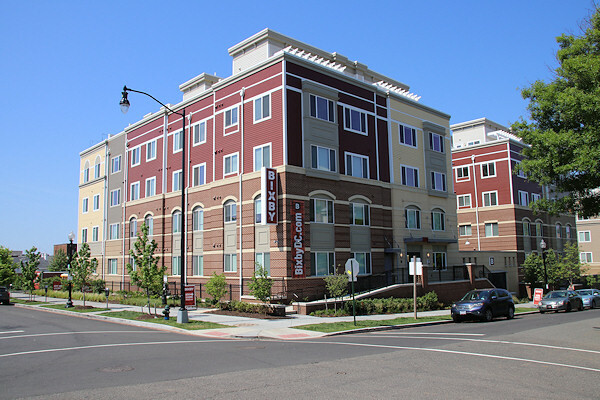 June 4, 2017 - The completed Bixby apartment building's signage and entrace at 7th and L Streets, SE. Looking at the southwest corner of 7th and L Streets, SE, where the old Capper Seniors building stood for many years before its 2007 demolition, and now with the Bixby well underway. 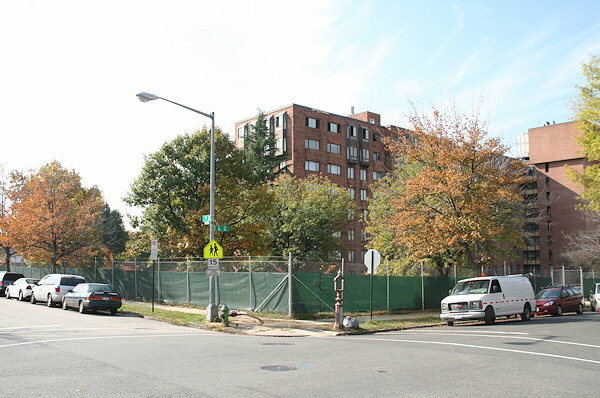 In late 2013, the Housing Authority secured funding to build on the south side of L Street between 5th and 7th a 195-unit apartment building (having decided in 2008 to switch from the original idea of building townhouses along this site). Construction began in spring 2014. Nov. 1, 2007 - The view of 7th and L similar to the above rendering, just as demolition began on the old Capper Seniors building. June 4, 2017 - The new one-block stretch of what will be 6th Street, SE, as seen from M Street. December 2006 - This is what the south side of L Street between 5th and 7th looked like for nearly 50 years. Built in 1958, its decline into a haven for crime, vandalism and drug use brought about its closing in 1973. After seven years of delays, it was reopened in 1981 as a 292-unit building for low-income senior citizens, though crime was never eradicated. The last residents moved out in early 2007. June 2, 2008 - The same location, a temporary surface parking lot after demolition was completed in late 2007. June 4, 2017 - And the same location again, with the Bixby's footprint right along L Street changing the view considerably. March 2007 - Looking west down M Street from 7th in 2007. March 2007 - Another view, from M Street at its intersection with Hull. March 5, 2014 - It took years of finagling, but at last a deal was struck to finance the new project, and the Housing Authority held a ceremonial groundbreaking. A rendering of 600 M Street (roughly the same angle as the above photo), the 500,000-sq-ft office development eventually planned for the southern/M Street portion of the site. No timeline for delivery has yet been announced. March 2007 - One more view of the entire building, as seen from M Street. June 2, 2008 - The same location. November 1, 2007 - The eastern face of the building, on Seventh Street between L and M.
June 4, 2017 - The same location, with the Bixby completed. November 15, 2007 - ...And from M.
November 8, 2007 - The southwest corner of the building, facing M Street. November 15, 2007 - The same spot, one week later. November 8, 2007 - Much of the initial demolition of the brick exterior was handled by Bobcats being driven into the walls from inside the building, rather than by swinging a wrecking ball. At left is a wall just being punched out, while at right you can see one of the other Bobcats at work. Don't hit the gas instead of the brake, guys! November 1, 2007 - From its position above M Street, the roof at old Capper Seniors provided some panoramic views of Near Southeast, and of all the construction underway. This shot was taken a few days before demolition started. The Yards is at left, south of M Street, followed by the US Department of Transporation (which is hiding Nationals Park), the Carroll Apartments and Capper Building #2, Van Ness Elementary (center), 1100 New Jersey, Capitol Hill Tower, and the skeleton of 70 I Street at very far right. For more, see my 601 L Street overhead photos. November 1, 2007 - The top floor of the old seniors building, with interior demolition complete, just a few days before the building itself will start coming down. November 1, 2007 - The old seniors building, now a relic of the "old" Near Southeast, with the neighborhood's future as a commercial and residential destination rising a few blocks away. November 1, 2007 - The elevator off the ground-floor lobby. November 1, 2007 - The old sign. March 2007 - A somewhat far-away view (thanks to a wide-angle lens) shows the old building's prominent position atop the eastern end of M Street, with newer buildings lining up to the west.